For 30 years the Naval ROTC unit at the University of Texas has run the Texas-OU game ball from Austin to Dallas. Their counterparts at the University of Oklahoma did the same. But neither will be making the trip this year. It’s not the death of a tradition – just another temporary casualty of the government shutdown. The UT Naval ROTC unit is normally a part of the annual torchlight parade, part of a huge pep rally in anticipation of the Red River Shootout in Dallas. As part of the ceremonies at the base of the UT Tower, Coach Mack Brown would normally hand the game ball to the commanding officer of the Naval ROTC student battalion. “I think it initially started out with one person doing it, taking the football and saying he’s going to run it to Dallas. 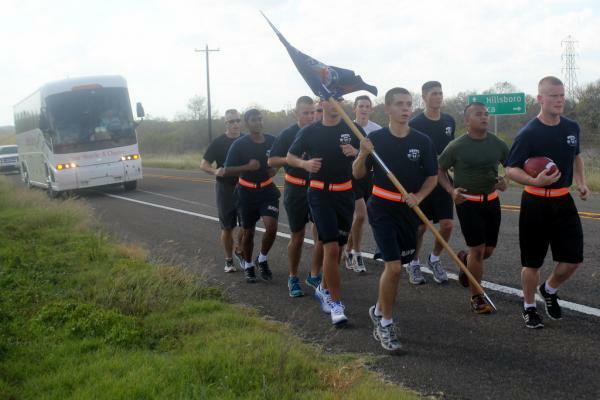 It’s grown to pretty much a unit event for the Naval ROTC,” says Captain John Eden, who oversees the program at UT. It’s about 200 miles north to the Cotton Bowl for the UT squad. 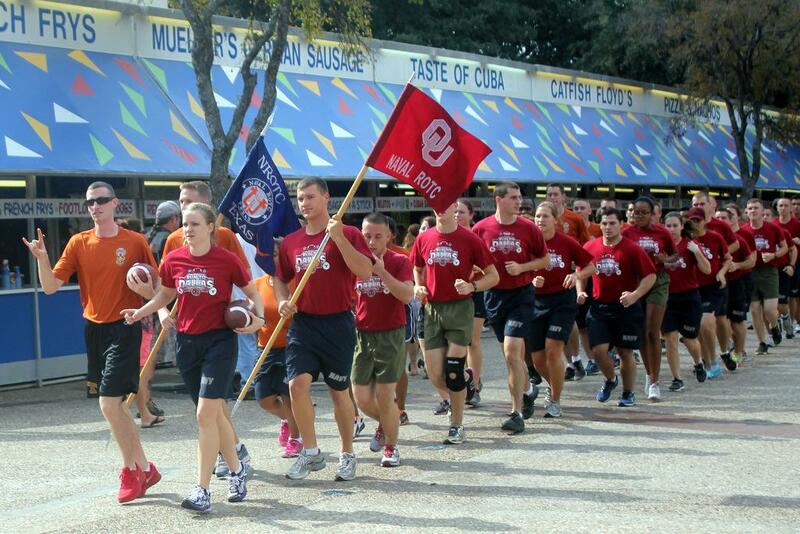 Meanwhile, their counterparts in the OU Naval ROTC carry their game ball south. The two teams meet the morning of the game for a bit of fun, including a group run through the State Fair and a flag football game. But the tradition isn’t considered essential to the mission of ROTC says Public Affairs Officer Lt. Matther Comer, so it was cancelled this year. “This event is clearly community outreach, so we don’t think it falls under the guidelines of what we’re allowed to support during the government shutdown,” he says. Eden, who has also helped carry the ball in previous years, says it was a fun but tiring experience that took multiple days. And while the students won’t get the extra exercise, the Naval ROTC program is still going full force. “The mission of making these young men and women prospective officers in the Navy Marine Corps is still going on,” he says. Update, 10:23 a.m. Fri., Oct. 25: The government has been open for more than a week, but some federal workers in Dallas-Fort Worth are suffering from "wounded morale, disillusionment and uncertainty about the stability of once highly sought after government jobs," The Dallas Morning News reports. Experienced government lawyers are looking for new jobs -- and employees worry about future paychecks. An Arkansas newspaper reporter is in stable condition at an El Paso hospital after rescuers airlifted her from Texas' Big Bend Ranch State Park. Cathy Frye, a reporter with the Arkansas Democrat-Gazette, had been lost for five nights. During a visit to Washington, D.C., over the weekend, Bishop Kevin Farrell of the Dallas Diocese criticized petty partisanship and polarizing rhetoric that he said makes it seem like "'I Did It My Way' has replaced the national anthem." The visiting bishop also urged government officials to remove obstacles to welcoming immigrants. If the federal government shuts down, the George W. Bush Presidential Library and Museum will shut down, too. The library, located on the Southern Methodist University campus, has posted a short note on its website. The library says that in the event of a shutdown, it won’t be able to sell tickets, update its website, produce blog items or post Facebook notes. All National Archives and Records Administration facilities will be closed and all National Archives activities will be canceled. When people think the State Fair of Texas, they don’t exactly think health, they think anything and everything, deep fried.